Daisy has her eye on an antique dollhouse and a classic Singer Featherweight at the local auction—until her friend and mentor, auctioneer Angus Backstead, is led away in handcuffs. It appears he bashed in the head of a drinking buddy who stole a set of fancy fountain pens. Daisy’s sure the sprightly old-timer couldn’t have done it. But if Daisy can’t stitch together the bidder truth—and soon—Angus will be going once, going twice… gone forever. 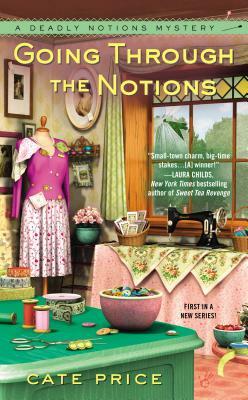 Going Through the Notions is Cate Price's debut, the first in a series of cozy mysteries featuring the proprietor of a small-town vintage notions shop. She is hard at work on her second novel.